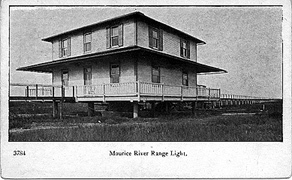 The Maurice River Cove Light Station was constructed in 1898 on the west side of the Maurice River mouth. It was rather unique in that the lights were not constructed upon the dwelling, but rather on separate posts connected by wooden walkways constructed over the marsh. The station consisted of a keeper's dwelling, and oil house, and a boat house. Indeed the light station was accessible only by boat, although at times the various keeper's constructed wooden walkways to dry land. The lights here were range lights constructed upon posts. A 1901 light list describes them as being 8 foot and 16 foot respectively. The lights marked the entrance to the Maurice River and were used by vessels plying the oyster trade. The station was used until sometime between 1924-1935 when the range was automated and the keeper's removed. The keeper's house burned on April 27. 1958.